📺 "Axios on HBO" debuts tomorrow at 6:30 pm. ET/PT, with much more from our Trump interview. 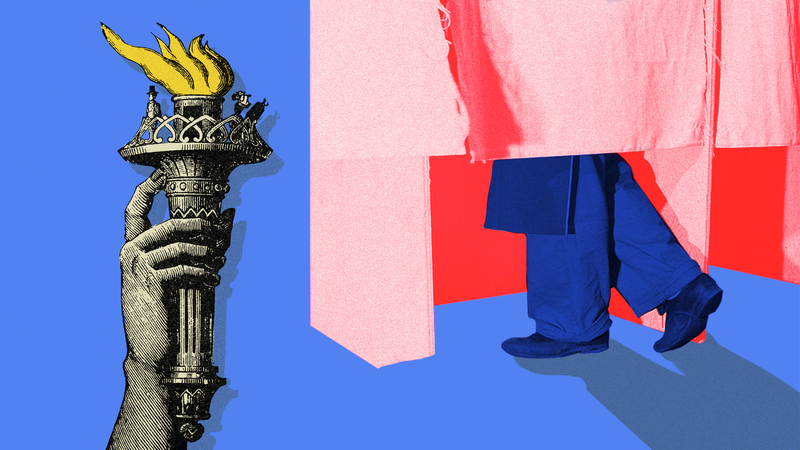 With the midterms less than 72 hours away, Axios politics reporter Alexi McCammond anchors our special report on this chaotic, expensive, historic election. 🌧 Situational awareness: Election Day could see a sprawling, strong Midwest storm (the literal kind), and the threat of severe weather in the Southeast/Carolinas, Axios Science editor Andrew Freedman reports. GOP lobbyist Bruce Mehlman points out that rain tends to favor Republican turnout. It's unanimous! The latest race ratings from the Cook Political Report, Sabato's Crystal Ball from the University of Virginia's Center for Politics, and FiveThirtyEight all show Dems on the cusp of winning the House, with Rs likely to hold the Senate (and even pick up a seat or two). We selected the Axios 8 to include not just high-profile races, but ones that would only be competitive if the "blue wave" is massive. The bottom line: Democrats are still riding a "blue wave" — but it's not strong enough to help them win all the races that looked within their reach earlier in the cycle. Texas Senate: A recent Quinnipiac poll showed Sen. Ted Cruz with a five-point lead over Democrat Beto O'Rourke. Texas turning blue would be a sign of an impressive "blue wave." As a symbol of the heightened interest, more than 3.6 million people have already voted early in the race, vs fewer than 2.1 million in 2014. Ohio governor: Both Trump and Mike Pence are making last minute stops in Ohio where Democrat Richard Cordray is leading Republican Mike DeWine by an average of 4.7 percentage points; but compare that to the Senate race, where Democratic Sen. Sherrod Brown is leading Jim Renacci by 16 points. A Cordray win could mean Democrats have a shot at other Midwest governorships. West Virginia's 3rd district: The latest poll shows Republican Carol Miller leading Democrat Richard Ojeda by five percentage points, and Trump is visiting the area four days before the election. If Democrats win here, it validates the party's strategy of targeting over 100 GOP-held districts. California's 45th district: If Democrat Katie Porter defeats Rep. Mimi Walters in this previously solid-Republican, Orange County district, they're likely to do well across southern California and are in good shape to take the House. Minnesota's 8th district: This was always the most vulnerable seat for Democrats, but the latest NYT/Siena College poll has Republican Pete Stauber leading by 15 points. It could be a rare House gain for the GOP. Texas' 23rd district: Republican Rep. Will Hurd has had to distance himself from Trump, but it looks like he's out of danger in this swing district. Voters now prefer him over Democrat Gina Ortiz Jones by 15 percentage points. Florida's 26th district: Republican Rep. Carlos Curbelo is trying to keep his seat in a district won by Hillary Clinton. In September, he was leading Democrat Debbie Mucarsel-Powell 47% to 44%, but now she's leading 45% to 44%. Iowa's 3rd district: Cindy Axne, with the backing of high-profile Democrats like Barack Obama and Sens. Kamala Harris and Amy Klobuchar, is leading Republican David Young in NYT/Siena College polls. If this seat flips, some Democratic strategists think that bodes well for flipping Iowa's 1st district, too. Go deeper: The Axios 8: How to tell the strength of the "blue wave"
Go deeper: Explore the graphic on the most expensive races. Women prefer Democrats by a 16-point margin (58% to 42%) and Republicans win men by a 17-point margin (50% to 33%), per a new Quinnipiac University poll. More women than men have voted early in key battleground states like Georgia (56%); Texas, Florida, and Tennessee (all 54%); Nevada (53%) and Montana (52%). 42% of all Democratic nominees for House, Senate, and governor are women, compared to just 14% of Republican nominees. For Congress overall, Democrats have nominated 198 women to Republicans' 59. In midterms since 2006, more women than men have voted by margins between 4 and 10 points. In the 2016 election, 10 million more women were registered to vote than men. The bottom line: "The level of enthusiasm among women is going to bear directly on Democratic success," said Jennifer Lawless, a politics professor at the University of Virginia. "If there is a 'blue wave,' that will exist in part because of women." A slim majority of the midterm congressional campaign contributions from America's biggest companies have gone to Republican candidates, an analysis of federal election data by Axios' Harry Stevens shows. "Helmer Zone" is hilarious. Dan Helmer may have lost his primary to challenge GOP Rep. Barbara Comstock, but this ad (bad karaoke in a bar!) lives on. Watch. "Women Rising" by Serve America PAC shows a montage of the many women vets who are running for office for the first time this cycle. It's the Year of the Woman with a little Bruce Springsteen and a lot of patriotism. Watch. "They're doing fine, are you?" is one of the funniest ads this cycle. It's just a bunch of senior citizens saying things like "Dear young people, don't vote!" and “Climate change? That’s your problem. I’ll be dead soon." Watch. "Casey," the ad from Florida's GOP gubernatorial nominee Ron DeSantis, is one of the more memorably pro-Trump ads of the cycle. He's teaching his kid to build a wall with blocks! Watch. "This Will Save Lives," shows Levi Tilleman, who lost his House primary in Colorado, willingly getting pepper sprayed in this gun control ad. Watch. Midterm elections have historically been a no-lose scenario for stocks. Dating back to the 1950s, the S&P 500 has always been higher a year after the midterms, no matter the outcome, writes Axios' Courtenay Brown. According to Capital Ideas, stocks in the year following midterms have performed twice as well as other years. Bottom line: Markets may shrug if there is a Democratic sweep, because the next Congress is "very unlikely to undo the major market-impactful legislation that has already been passed under President Trump," like tax cuts, strategists at UBS point out.